New gecko owner, is this normal behavior? Thread: New gecko owner, is this normal behavior? We've just adopted a gecko from family friends. We re-did her tank setup, but now it's been about 10 days and I think she's settled in. Her behavior is now pretty consistent so wanted to check with you guys on whether it's normal or not. Stats: 4yr female, hot hide is 88-91, cool hide 69-71, 20 gallon tank with only UTH (no lamps). She spends most (like 22-23hr/day) in her hot hide even during the night. I've got a cam hooked up and she isn't very active even in the middle of the night. When she comes out she seems to hangout closer front of her hot hide but closer to the middle of the tank. Otherwise she walks around for a few minute and then goes back inside. She doesn't climb on or in any of the items in her tank. Do Gecko's get bored? My tank is kind of spare compared to some on this forum. In the last 5 days, I only saw her drink water once. She poops daily and the urates are bright white. I have her hot hide in the corner and she always poops in the same corner which is on the backside of the hot hide. Convenient for me, but seems odd that she will poop in exact same spot every single day. I feed her every other day (mostly crickets, but just started using mealworms) and she's an active feeder. I have no problem getting her to come out and chase down food to eat. She doesn't really explore that much. She seems okay to handle, no biting, no defensive tail position. And she doesn't fight or squirm but also doesn't like to sit still when out of her cage. I knew she was nocturnal, but I would have thought she would be way more active during the night. Does winter impact their behavior? I'm in Seattle-area so it doesn't get super cold. Some leos go into semi-brumation during the winter. My 13.5 yo female never has. It's quite typical for leos to choose a poop spot and then stick with it. How are you doing for powdered supplements? Last edited by Elizabeth Freer; 01-04-2019 at 03:55 AM. The person we got the gecko from was doing daily crickets with a daily dusting of calcium without D3 and no extra calcium in the tank. Based on my reading that seems wrong, so now she's on every other day feeding but still using calcium w/o D3. 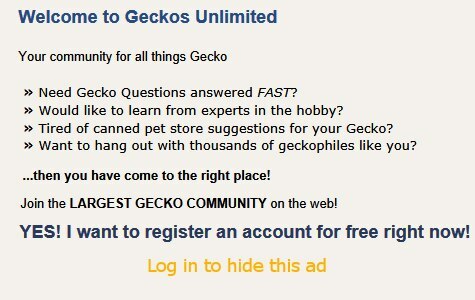 On one gecko site it recommended Reptivite with D3 and to use it with every feeding without any additional supplement. I bought some of that but in between ordering it and delivery I came across this site which recommends something different so still trying to figure that out. For the photo periods, are you thinking it's not bright enough during the day? We have her in our family room so during btue day most of the lights have been. It's not in direct sunlight but there's a fair amount of natural light as well. Maybe she's just settling in. 10 days is really short to tell her habits. You could try photoperiod lighting and see what happens. It's kind of a combo between under tank heat and photoperiod. For a 20 long: 30 x 12 I suggest an Ultratherm UTH 11 x 17 inches. That's not overkill. Please share a photo of your new leo. Can you add a warm humid hide too? You could even make one. It's best to only use Zoo Med's Reptivite multivitamins with or without D3 at only 1 feeding per week. That's what my vet recommends. A little vitamin A acetate (retinol) is all that's needed. I use "without" and add Repti Calcium with D3 at a second feeding per week. Since D3 is fat soluble, it sticks around in a gecko's body for a week or so. I think Zoo Med's supplements are excellent products. I use them for my leo and my other geckos, some more, some less. Many GU leos have thrived with schedules 124, 125, and 126. Continue on since all weeks are identical. . . . . .
For 132 click: Why I use and highly recommend Zoo Med's Repti Calcium with D3 & Zoo Med's ReptiVite multivitamins without D3? Last edited by Elizabeth Freer; 01-04-2019 at 03:57 AM. Is she in a glass tank? Because it may be a bit too cool in there. Not sure a 15 watt will help raise air temps as well? The tricky part is adding over head heating without drying out the tank. Dehydration and shedding problems is very common. Is the 88-91 ground temp only? Then the rest is 69-71? I had humid hide but it was gigantic in the tank so I removed it. Making one seems easier. Should I keep it in there full time or just when she's shredding? Here's a recent photo: Screenshot_20190104-201228.jpg Beyond a humid hide, do I need more stuff in the tank? I don't really care what the tank looks like, so it's really a question of whether she needs more items. The ground temp on the cool side is 69-71. I've got some tank thermometers on order so I can get a better sense for the ambient air temps are. At this point, I have a nearly full jar of Calcium without D3 and a brand new jar of Reptivite with D3. Are these useful or do I need to throw away and get the ones you recommended? From what the previous family said, it sounds like they did "calcium without D3" and nothing else for 4yrs. Any chance she's got health issues not having the repitivite for 4 yrs? Please share a different photo of the whole enclosure. Keep the warm humid hide in the enclosure 24/7. It helps with shedding and with keeping your leo hydrated. If humidity in your home ranges from 50-60%, shedding problems could be non-existent anyway! I don't know what subtle problems could result from multivitamins lacking until now. Vitamin A acetate (retinol) helps keep eyes healthy. Adding shredded carrots to your mealworm and cricket diets will also supply pro-formed vitamin A (beta carotene). Using Reptivite regularly from now on should help your leo along. I always find it somewhat amazing how a leo could go for 4 years without vitamin D3 and yet not have MBD! Did she get any UVB? Something in her diet must have supplied D3. It's fine to use a wee pinch of Zoo Med's Reptivite multivitamins with D3 on Mondays and Zoo Med's Repti Calcium without D3 on Thursdays. Plain calcium carbonate never expires. I have several Phelsuma under UVB. That's one reason I opted for Reptivite without D3. The other reason is that Repti Calcium with D3 offers more flexibility if, for some reason, I needed to use the D3 product more than @ 1 feeding per week. Last edited by Elizabeth Freer; 01-05-2019 at 08:54 AM. I always find it somewhat amazing how a leo could go for 4 years without vitamin D3 and yet not have MBD! Winterminute- Do you know what was being fed to the crickets?